VILLAS AND APARTMENTS TO RENT IN BENAMAHOMA, SPAIN. 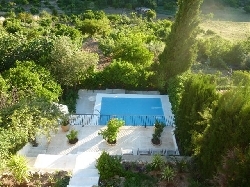 Welcome to our selection of holiday homes to rent in Benamahoma, Spain. Benamahoma is one of the famous white towns of Andalucia, the whitewashed villages that can be found in the southern hills and mountains behind the popular tourist destinations of the Costa del Sol. Benamahoma is one of the most northerly, located about 100 kilometres from the Mediterranean and around 70 kilometres from the nearest airport in Jerez. Home to one of the best 'Moros y Cristianos' festivals in all of Spain and surrounded by stunning natural scenery, the village is well worth a day trip if you are staying in one of the Costa del Sol resorts. As one of the more remote of the white towns, Benamahoma can often be quieter than some of the more popular destinations. However, the main road into the village is narrow and not suited to lots of traffic; those who can are advised to park at the bottom of the hill and take the pleasant walk up to the village. Once there, you can wander the narrow, shady streets, visit the tiny village church and enjoy the view over the surrounding peaks and forests. One of the main reasons that people visit Andalusia and the white towns in particular is to enjoy the walking trails between them that take you through the beautiful, lush countryside. There are several of these routes, including a mountain biking trail that starts in Benamahoma. If you need advice on which paths are most suitable for your experience or time limit, maps and information are available in the local tourist office. One of the most popular is the four-mile round trip following the Majaceite River through forests and the lower slopes of the Andalucian hills. The 'Moros y Cristianos', or Moors and Christians festival is held in villages and towns throughout Andalusia and others parts of southern Spain during the summer months. The fiesta in Benamahoma is one of the biggest in the region and is usually held in early August at the height of the tourist season. The event takes place over several days and features mock battles, street banquets and lots of water hoses and buckets � so make sure you bring your swimming costume! If you are visiting earlier in the year, Easter in Benamahoma is celebrated with a bull riding event in the main street. Looking for self catering holiday accommodation in Benamahoma? Then below is a selection of holiday apartments in Benamahoma and holiday villas in Benamahoma that can be rented direct from their owners. You can either click on each listing for further details or you can use our search engine on the left if you are looking for something in particular. Walking trails - If you�re a fan of long walks across the countryside, then why not pay Benamahoma a visit. With a range on walking trails, paths and even mountain bike trails, viewing the lush countryside is not one to be missed. Moors and Christian�s festival - The Moors and Christians festival is held in a number of towns and villages throughout the province of Andalusia. It is usually celebrated in Benamahoma between the 5th and the 8th August. Riders of the Lost Trail - Riders of the lost trail is a Guided Off Road Motorcycle Trail Tours which offers one of the very best guided off road motorcycle tours. You don't have to be an experienced biker to take part of the tour as they offer tours for all skill levels. Nearest airport - Jerez airport is 70 km's away from Benamahoma. Benamahoma is one of the famous white towns in Andalucia, which is situated in the southern hills and mountains behind the popular tourist destinations within the Costa del Sol. Benamahoma is one of the most northerly of the white towns, located about 100 kilometres from the Mediterranean. Since Benamahoma is more remote then some of the other more popular white towns, Benamahoma is one of the more quieter and peaceful places to visit.